In an elaborate marketing hoax, it appears the Sony PlayStation2 game Shadow of the Colossus is being promoted with sitings of giant, unexplained archaeological findings around the world. Three large, prehistoric entities have, reportedly, been found - one in India following the tsunami, one in the Sulu sea and one in Bam, Iran following an earthquake. There's even video news footage from the Indian finding to go along with the hoax. Fueling the notion this is all just a big marketing ploy - albeit a grand and intriguing one - Joystig points out all this information appeared at the same time just this week, an anonymous tip pointed them out, there's the predictable blog (with a podcast) and two of the site's follow that tired, Geocities-like, "this site is so bad it has to be real" design strategy. One has to admit, it is quite admirable the lengths to which a company with boatloads of money will go to get its products talked about. One also has to question the potential backlash of such an elaborate lie. 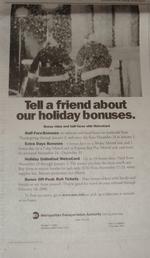 We know the Internet is full of lame, cheesy, oddball promotions but this one sure grabbed our attention. On SaveMyFinger.com an man calling himself Carl Valentine made a bet with his "internet marketer" millionaire friend he could send 2 million people to SaveMyFinger by April 18, 2006. If Valentine succeeds, he will play his friend in a poker match to win the million dollars. If Valentine fails to generate 2 million visitors to the site, he will play his friend in a poker match to keep his right index finger. That's right. If Valentine doesn't achieve 2 million visitors and loses the poker match, he will also lose his finger. 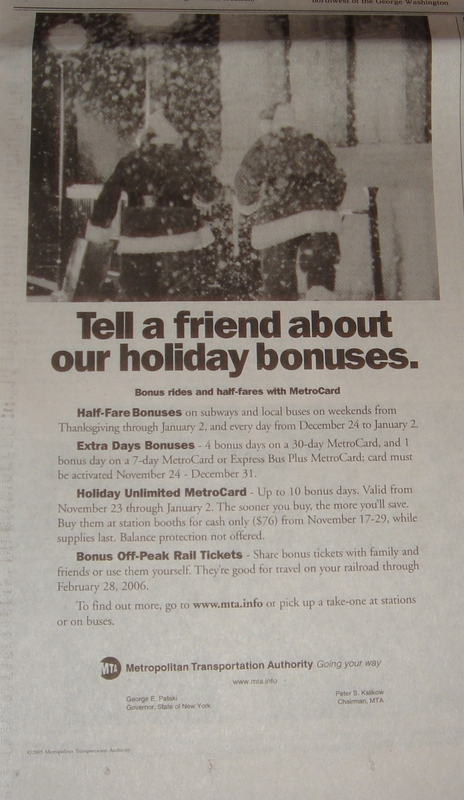 Resident rail rider Bucky Turco points out the idiocy and irony of a New York City MTA ad placed in today's New York Times promoting discount Holiday fares by asking what good reduced Holiday fares will do if the transit union carries out its planned strike in two days thereby making fares of any kind irrelevant. Yes, my friends, what good indeed? Interactive agency Inspire has created an online video featuring Mr. Jefferson who loosely reveals all of his family's inner secrets illustrating just how unprotected life can be if, of course, one does not use Microsoft security products. While the video (the Netherlands version) is in English, the sites are not. We'll leave it to you Belgian speaking folks to tell us whether we've made any sense here. And would Adobe, for the love of David Ogilvy, please make freakin' Flash understand a browser's Back button? For web designers, Flash animators, computer games developers, video artists and creatives in search of good music for their work can now turn to Premiumbeat, a service that offers royalty-free music. The site is categorized by genre and includes music preview and quick download. We thought you creatives out there would like to know. Yesterday at MPG's Media Contacts broadband content summit in Boston, Yahoo Content Operations VP Scott Moore announced Yahoo would launch Wow House, a home makeover reality show which will follow two families as they spend $10,000 to upgrade their homes electronics such as a home theater. Both families receive the upgrade but only one gets to keep it. Viewers vote their choice. MobilePlay, a company that provides smart phones with free content in exchange for ads, of course, has added Pocket PC to its list of devices through which it can offer its content. Launched in early 2005, MobilePlay currently works with Palm, Blackberry and now Pocket PC phones and PDAs. In return for downloading the MobilePlay software and viewing accompanying ads, users get free content from Business Week, PC World, USA Today The Weather Channel, Gawker, The Sporting News and others. Microsoft and Volvo are charter advertisers on the service.